CuteZCute to the rescue again! I made this tiger theme lunch with the CuteZCute Cuddle Palz set. When Nikolai was smaller, I used to think that our Go Green lunch box might be a little large for him, but as moms everywhere know, they grow fast, and now it is just right. One of the features which I love most about the Go Green lunchbox is the leak proof seals which also prevents foods from moving around to other sections. 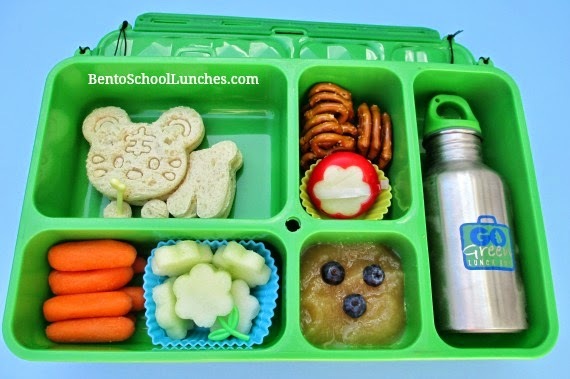 Top left - A cute tiger shaped sandwich cut and stamped with the CuteZCute cutter and a little bone pick. Top right - Mini pretzels and Babybel cheese with flower shaped cutout. Bottom left - Organic baby carrots and honey dew melon cut to flower shapes. I love the Cuddle Palz too! The lunch looks so yummy, great job! Cute lunch! I'll have to get the cutezcute set, looks cool!